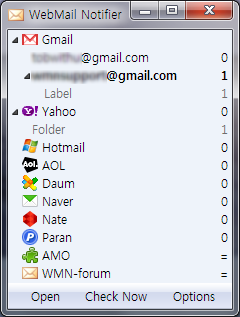 If you want to manage multiple Email accounts directly in Firefox then the Firefox extension named WebMail Notifier will provide you a solution.WebMail Notifier for Firefox is a basic add-on that checks e-mail for a variety of different types of e-mail accounts.It checks your webmail accounts and notifies the number of unread emails. You can use multiple accounts in a same host. If you want other webmail provider, you can make your own script.